Looking for the perfect gift for the wine lover on your holiday shopping list? It seems to be the season for putting together gift baskets at the winery. We have come up with a five go to gift basket ideas to help the headache of trying to put together a gift basket that someone will love. We have five different themes and ideas that are sure to please the wine lovers on your holiday list this year! For the taco lover, guacamole devourer, piñata fanatic in your life! Let’s fiesta, then siesta with this holiday gift basket! 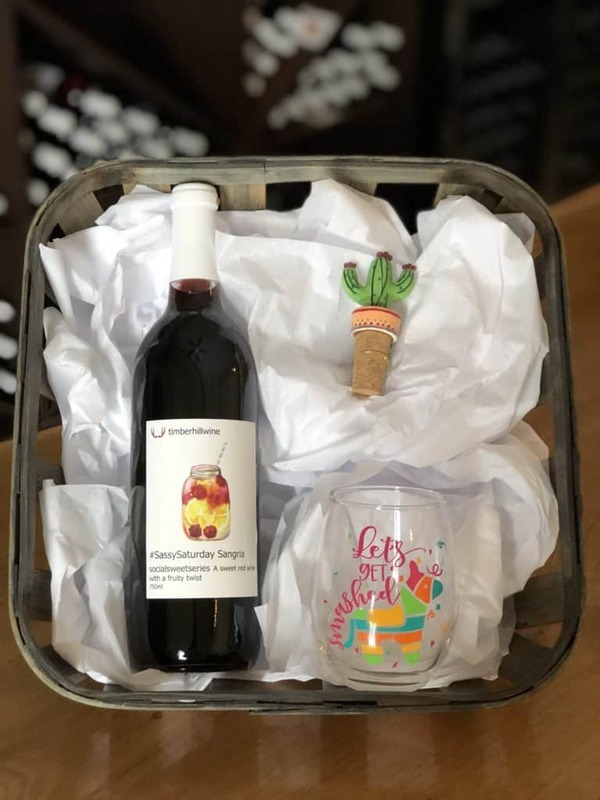 We have #SassySaturday Sangria or #MargaritaMonday that will go perfectly with one of the “Let’s Get Smashed” piñata wine glasses from CDAJ Creations and one of our new cactus wine stoppers by Natural Life. 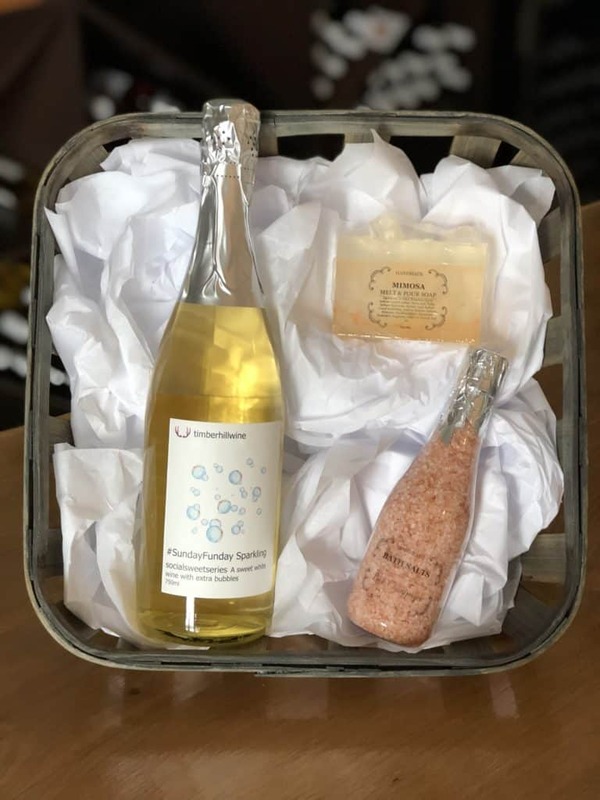 This luxurious holiday gift basket will be sure to please the wine lover who is just looking to relax and take a warm bath with a glass of wine. The soap and bath salts are made by our team member Kim and smell absolutely amazing. Pick out a bottle of wine like our #SundayFunday Sparkling to go with it so you can have double the bubbles! All together this gift basket is only $40! #ThrowbackThursday Red is our most popular wine. During the winter months we love to serve it warm with mulling spices. We custom make our own blend of mulling spices using cinnamon, nutmeg, and orange peel. Each pack of spices is good for one bottle of wine. 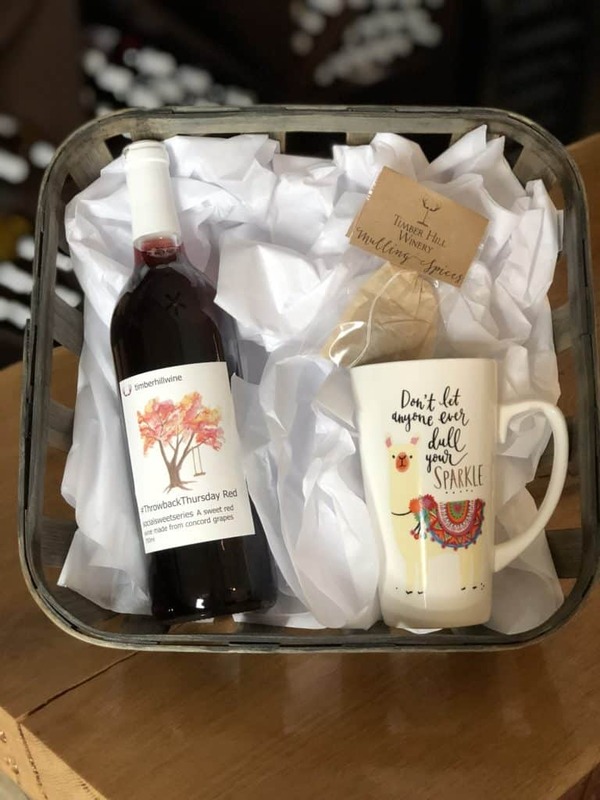 This gift basket wouldn’t be complete without an adorable mug to put your delicious mulled wine in. This basket with everything pictured is only $30. For the spicy Bloody Mary lover in your life! This holiday gift basket comes with our infamous Jalapeño Wine to keep up any Bloody Mary with some extra heat. It also includes some of our favorite local Bloody Mary Mix from Bushel & Peck’s. Don’t forget the beer chaser though! Another creation from our talented team member Kim is this Harvest Ale bar of soap. It looks just like a mug of beer to chase your spicy Bloody Mary down. 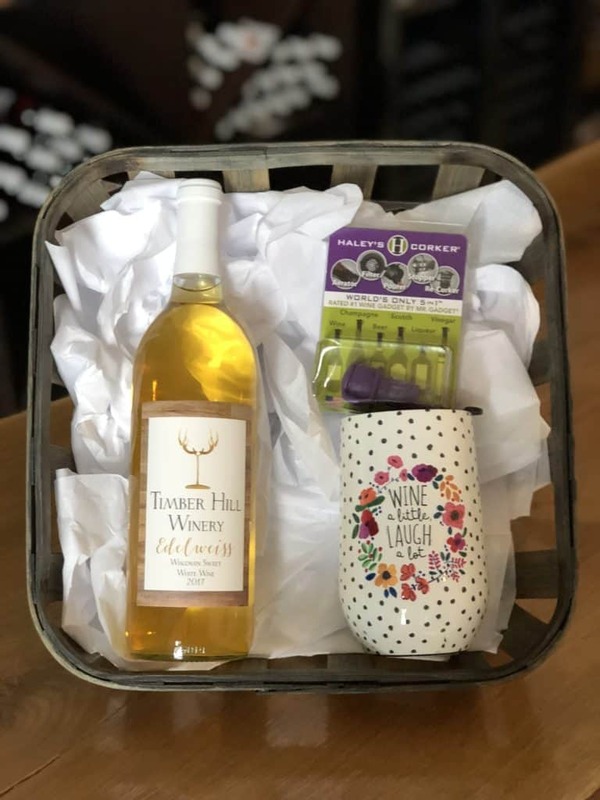 We have a lot of neat insulated wine tumblers, corkers, and more items that will fill any gift basket to make the perfect gift. With over 20 different wines, you will be sure to find a bottle (or three) to go with the rest of your goodies. We recently shipped out a gift basket to Illinois containing some of these items and a few more bottles of wine. We can actually ship to over 30 different states besides our home state of Wisconsin. To pick out a wine to add to any gift basket please visit our wine list. To order some bottles to ship to someone for the holidays you can visit our online shop. The items in this gift basket come to a total of $55. Still looking for something unique to give the wine lover on your nice list? 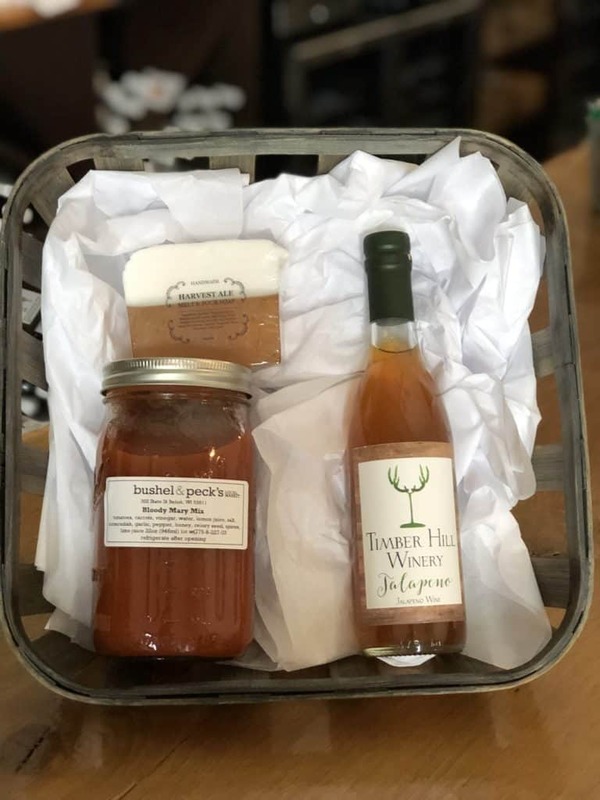 We have so many other unique items in store to make the perfect holiday gift basket for anyone! If you want us to custom design a basket for someone on your list, just send us an email or visit our tasting room. We would love to help you! Holiday’s can be stressful and we are here to make it easy and fun!